From Three A. 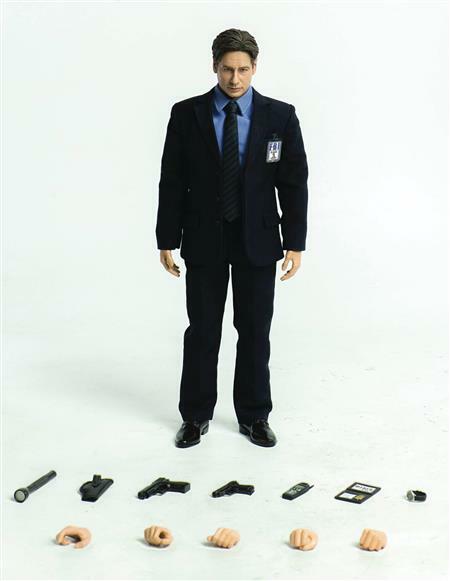 This stunning Agent Mulder collectible figure stands approximately 12' tall, with an articulated and highly detailed body and outfit, featuring realistic likeness of David Duchovny in the critically acclaimed The X-Files television series! This collectible figure comes with tailored black 2 piece suit; formal shirt and tie; belt and black balmoral shoes. FBI IDs, Sig-Sauer P226 and Walter PPK, holster, watch, flashlight and cellular telephone are included with the figure along with multiple exchangeable hands.